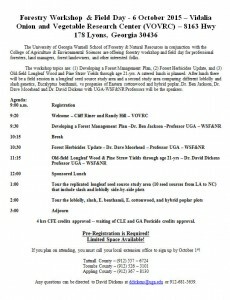 The University of Georgia Warnell School of Forestry & Natural Resources in conjunction with the College of Agriculture & Environmental Sciences are offering forestry workshop and field day for professional foresters, land managers, forest landowners, and other interested folks. The workshop topics are: (1) Developing a Forest Management Plan, (2) Forest Herbicides Update, and (3) Old-field Longleaf Wood and Pine Straw Yields through age 21-yrs. A catered lunch is planned. 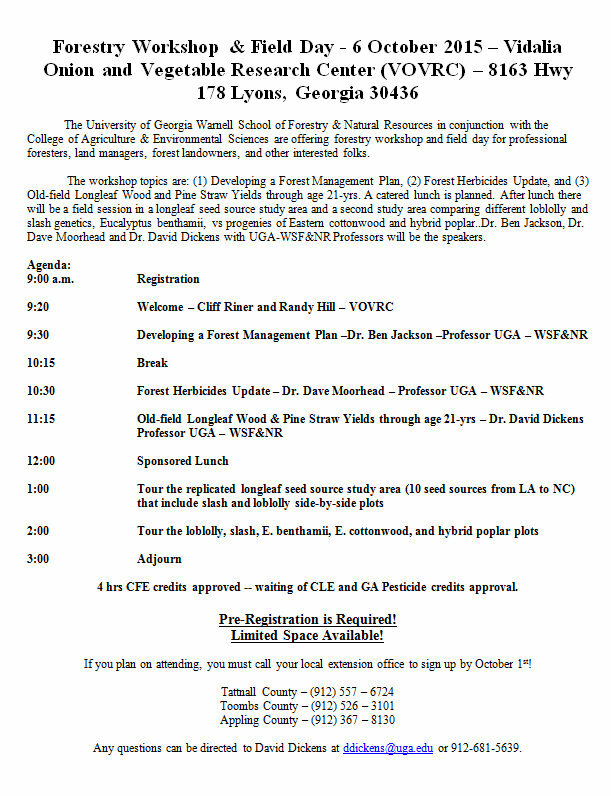 After lunch there will be a field session in a longleaf seed source study area and a second study area comparing different loblolly and slash genetics, Eucalyptus benthamii, vs progenies of Eastern cottonwood and hybrid poplar..Dr. Ben Jackson, Dr. Dave Moorhead and Dr. David Dickens with UGA-WSF&NR Professors will be the speakers. If you plan on attending, you must call your local extension office to sign up by October 1st!